This entry was posted in baking, Childhood, Christmas, cookies, Culture, Family, Food, Germany, Holidays, Recipes, Tradition and tagged baking, Christmas, cookies, Germany, walnuts by Jadi Campbell. Bookmark the permalink. Sweet article and great tribute to Uwe’s mom. I just went and saw her this morning. I’m glad we moved her closer. But man, I miss her baking. My mother was also a German baker who make wonderful stuff. My problem with commercial desserts in the US is that they are too sweet. Europeans do not make their pastries overly sweet and I love it like that. Miss my Mom’s baking too. So you know how awesome desserts are here! We used to go to family gatherings where all the women brought home made desserts. At some point during the event each one would make her way over to wherever I was sitting. Then she’d pat me on the shoulder and inform me she’d tried what I’d baked. “It was good!” each one would reassure me. Nice of them, but I was never convinced. Miss those days. My mother had 3 sisters and 3 sister-in-laws. OMG! The food was fabulous. Now when you go to events, the hostess bought them at the grocery store — all sugar! Yuk! I can bake some of them but I don’t bake enough to keep the knack of having it perfect. Mmm, they do sound delicious! 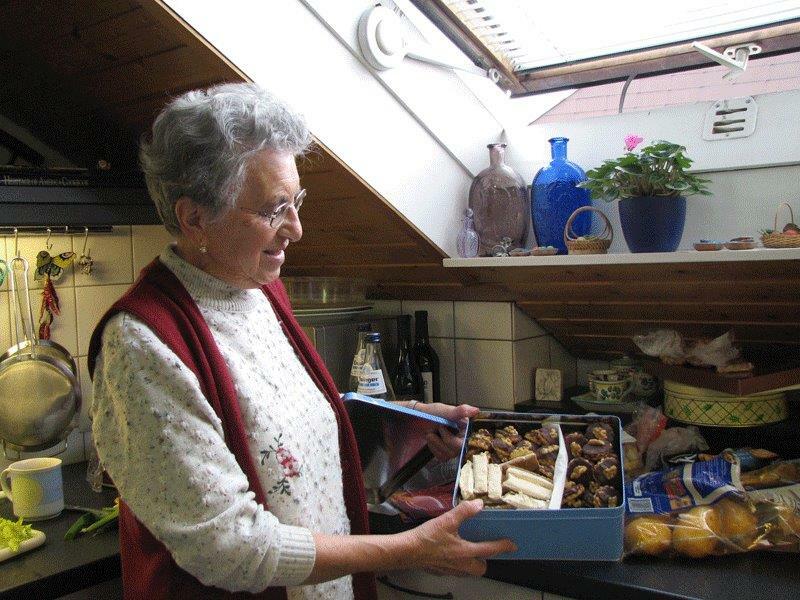 For me, it was the Norwegian cookies of my grandmother and great-grandmother, full of butter and light as a breeze. Mine are like roofing shingles by comparison. But…we have to try, right? Do you know the German tradition of giving Lebkuchen cookies with their own tins? Once the cookies are gone – which happens fast – people keep the tins. They’re often decorated with maps of medieval city castles, etc. The cookies and cakes sound delicious. I will have to try the recipe! I do bake a lot–not as much as when our girls were home when I baked cookies a couple times a week and also for school events. A couple times a week? Wow. I’d love to have you as my neighbor. I used to massage an older woman who lived nearby. One morning I opened the door to our apartment and found a basket of donuts she’d just made. They were still warm. I used to bake a lot of cookies, especially over the holidays. I was young and poor and they made lovely gifts for those who came to call. When I first married, my kids and I set out to baking, and they loved it as much as I did. These last few Christmases have them less interested. I continue, although not at the pace I did 20 years ago. I hope one day they’ll look back fondly on traditions and customs as you did here. Trust me: your kids will beg you to bake them again. And then they’ll follow you around your kitchen insisting on copies of your recipes. My sisters and I liked to perch on the kitchen counters and watch Mom cook. We could have conversations and a glass of wine or a beer and supposedly absorb some of her cooking brilliance just being in her presence as she made our favorite meals. What a sweet post. Cakes twice a week is amazing. If I bake one from scratch, for a birthday for example, it takes ages! We do have a tradition of making Christmas cookies but some years are more successful than others – I’m definite not consistent with the quality! I am glad I checked out your blog, as suggested by Brigid Hagan. I enjoyed your musings as well as the recipe. I do have a request, though. I do not use coffee or alcohol, so cannot make use of this particular recipe, although it looks fantastic. I can share the recipe with friends, but am selfish enough to want one for moi! Please share another favorite of your mother-in-law’s cookies. In fact, I would love to have as many of them as possible. I lived in Frankfurt as a teenager and fell in love with Germany. I am pleased to have found someone blogging from there. I supplied my email address to leave this comment. Will I automatically receive your new blog posts, or do I need to sign up for them, separate from supplying my email address? Ach ja, eine Schwarzwälder Kirschtorte. Heaven! You come from a family of master bakers. I content myself with the wonderful bakeries on every corner here (with occasional attempts at German recipes).